“On account of the lions?” my wife Tomoko shot back. When I told my friends I was planning on spending two weeks driving around Namibia in my own Land Rover, incredulity was the most common response I got. Sure, I played it up a bit (the roof tent is actually for convenience, not defence), but the fact is, self-drive is an incredible way to see Africa. And people do it all the time. That’s what I kept telling my wife, anyway. She wasn’t completely convinced. And I really needed a photographer. I don’t remember where I first heard about Namibia. Perhaps it was from photos of towering dunes plunging into a bleak and unforgiving sea. Or maybe it was the old maps that fascinated me as a child. A name like the Skeleton Coast surely caught my eye. Deserts have always been my personal landscape. And it was time to explore southern Africa’s greatest. I didn’t want to do it just any old way. I wanted to drive myself. I contacted Safari Drive because the U.K. company has bases and vehicles in seven countries. It supplies the Land Rover and camping gear, and works with you to plan a route. It’ll even handle campsite and lodge accommodations. All we had to do was show up, attend a briefing and drive into the sunset in our very own 4×4. It really does make it that easy. 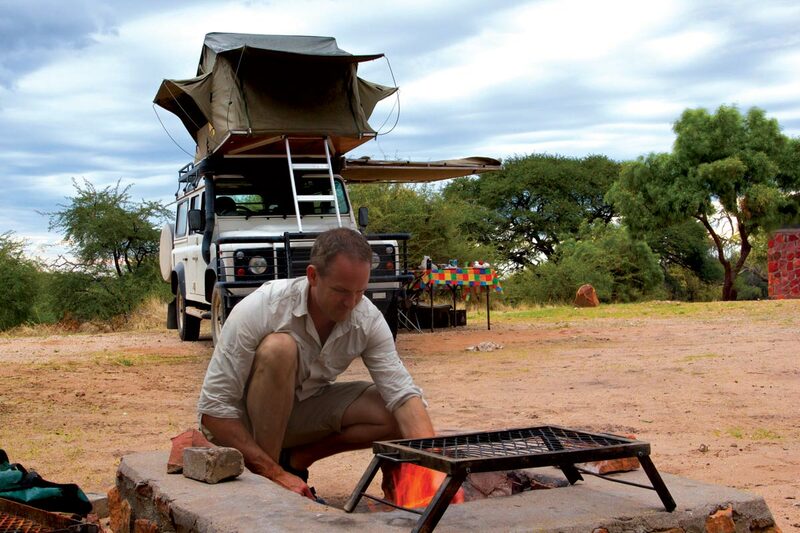 Firing up the grill at the Waterberg Plateau. The Land Rover Defender Tomoko and I picked up in Windhoek, Namibia’s capital, was fully kitted with pop-up roof tent, chairs and table, repair kits and bedding. Cooking gear and fire-starting equipment were stowed away in a built-in drawer. We had a fridge that ran off its own separate battery, and the rental company even threw in a bottle of South African red. What more could an explorer need? “What if we went this way instead?” I asked, pointing out a smaller road through a steep mountain pass. I didn’t care about adrenaline sports. I wanted to drive through Kuiseb Canyon, the setting of Henno Martin’s memoir The Sheltering Desert. It’s the story of two German geologists who fled to the Namib Desert to avoid internment at the outbreak of the Second World War. They hid in a remote canyon, where they learned through painful trial and error how to live off the land, and they survived out there for two and a half years. It’s an incredible story, sensitively written and brilliantly observed, and I couldn’t miss the chance to see that landscape for myself. The C26 began right outside Windhoek. I quickly got used to driving the Land Rover on the road’s loose gravel tracks and over tooth-shaking corrugations. It’s noisy, and the heat of the gearbox baked my left leg. But it could cross anything we’d find out there without breaking a sweat. The hours passed quickly as we threaded our way between low rolling hills. Once in a while we saw small intersecting tracks—a reminder there really were other people out here, living in ranches somewhere beyond the horizon. We stopped for water and photos before the roller coaster descent through Gamsberg Pass, and as the engine ticked over, a troop of baboons crossed the road in the distance: first a scout, then two more, and then a long scrambling simian row. They passed in the dozens, and we saw more loping through the low scrub behind them. We didn’t find the remains of Henno Martin’s shelter in Kuiseb Canyon, but I spent a silent hour scanning the landscape he wrote about through my binoculars, wishing we had another week to explore this remote wilderness on foot. Riding down the Namibian desert. The landscape changed the way paint fades in the sun; so gradually we barely noticed it. We drove through silent heat-blighted flats punctuated by postcard African views of grassy spaces dotted with small trees. Boney rock structures and bleached mountains framed the distance. When we finally entered the true Namib Desert, trees were replaced by dead shrubs and gravel flats, then sand, and finally dunes: a small expanse of hills on the left, and the 130-metre tall bulk of Dune 7 on the right. On the outskirts of the coastal town of Walvis Bay, triangular yellow signs warned of “SAND!” It veiled the road in swirling patterns and blotted out the tail lights of the vehicles ahead. Strong coastal winds brought a brown-filtered view to the world beyond the glass, and that feeling of grit permeated the car. Twilight brought us to Swakopmund, and a room on wooden pilings at the scrub and sand edge of an angry sea. Every window was a mobile painting with shifting Atlantic views, but we got there so late it faded to black before we could enjoy it. The entire town is a microcosm of Germany shipwrecked on the African coast, with beer halls, pastry shops and antique dealers selling relics of colonial rule. We ate dinner in a restaurant at the far end of the jetty—fresh oysters and a massive seafood platter of shrimp, crayfish, squid, clams and whitefish—and caressed our palates with a soft white South African wine. Waves bashed the pilings and the entire building shuddered like a ship at sea, but no one seemed to notice. 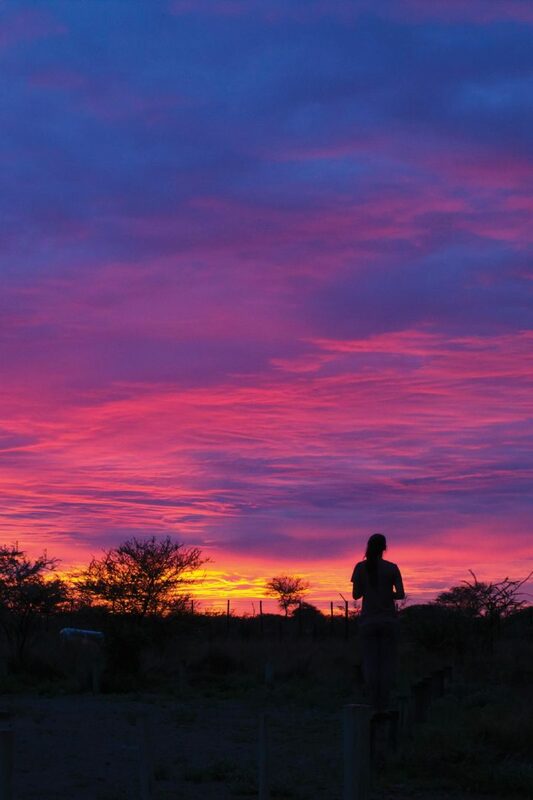 The majestic sunrise over Etosha National Park. In between courses, the waitress taught us phrases in one of Namibia’s 28 distinctive dialects. “There are four different clicks,” she said, referring to that distinctive southern African click of the tongue, and demonstrating each. The first three were easy, but the fourth called on a type of lingual gymnastics that had to be trained from birth. Our first attempts brought sympathetic giggles. Further tries brought three other waitresses from nearby tables. “You really can’t do it at all!” they laughed. I shook my head sadly and sought solace in the wine. She turned to Tomoko and said, “Inam si ta ge a. You should use that. It means ‘I love you.’” And she scurried back to the kitchen in a wake of low giggles. The next morning I fell into breakfast conversation with a retired couple from Cape Town. “We’ve spent the last year living from the truck all over Southern Africa,” they said. “All sorts of people do it. 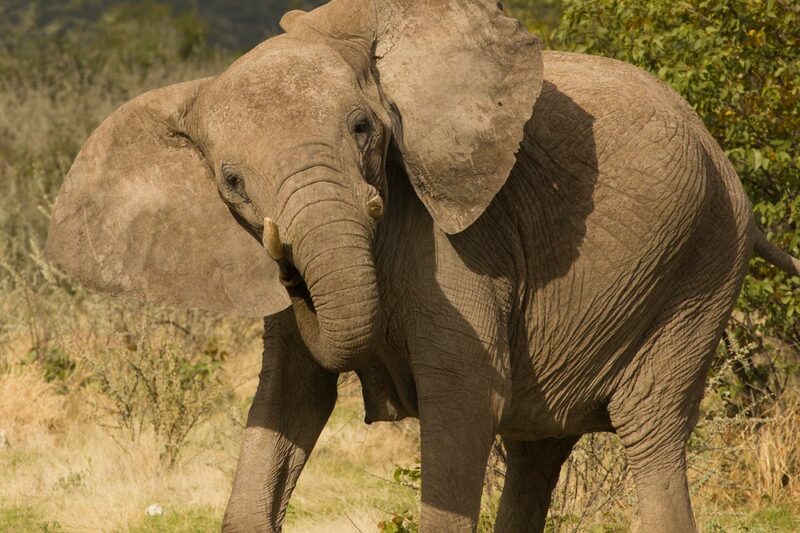 You can drive and camp throughout Botswana, Mozambique, Zambia, Malawi,” to name but a few. I opened my notebook and wrote: “Plan a much longer trip.” We’d only begun, but I was already hooked. We wouldn’t find fuel on the next 420-kilometre stretch up the Skeleton Coast, or much of anything else. I filled the long-range tanks with diesel, and bought meat, water and beer for the cooler. The deli counter also stocked six kinds of biltong—spiced and dried meat twisted into sticks—the perfect snack to gnaw at on the go. That was all we saw of Swakop in daylight. The desert was calling. The first leg was a fast drive on hard-packed roads of compacted sand and salt. That same salt laced the gravel flats with a delicate covering of crystals, like ice on a puddle, broken by the occasional 4 x 4 track that led to fishing spots on the shore. The Skeleton Coast’s unique ecosystem is formed by the frigid Benguela Current. It sweeps up from the Antarctic to meet hot barren desert in a blast of fog and constant south-westerly gale-force winds. The wind is forever pushing the waters up the coast, and those waters are packed with plankton, krill and cold-water fish, making this a traditional feeding ground of whales, and of modern local fisherman. Beyond the sand-blown town of Henties Bay, the only trucks we saw were mounted with enormous fishing poles that stuck up from their bumpers like oversized military antennas. They were all going the other way. No one goes north because the farther you drive the farther you are from anything at all. 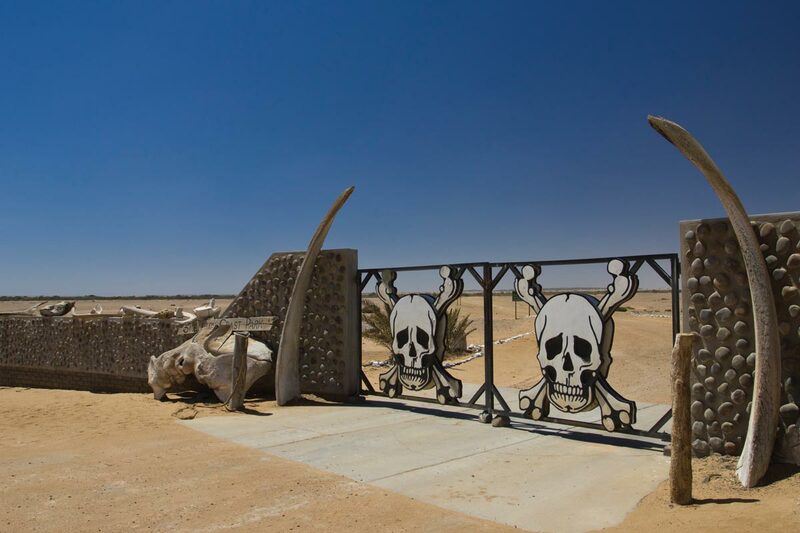 The Skeleton Coast Park’s Ugab Gate warns the unprepared. That total desolation is the real attraction of the Skeleton Coast. It reminds you of how lucky you are to be alive, and just how fragile that living state truly is. The coast is fear, trepidation and fascination all rolled into one. And it has always been a place to approach with great caution. Its forbidding name was inspired by the skeletons of whales that often wash up on the beach, and the skeletons of stricken ships. This place has been a graveyard for ships right up to the present day. Imagine the plight of a sailor who survived the angry seas, perhaps by clinging desperately to a bit of floating wreckage, only to be cast upon this godforsaken shore. There’s no shelter, no food or water, and temperatures of 50 degrees C. The only salvation lay beyond hundreds of miles of sand and salt pan, and then arid mountains. The desert claims the lives that the sea lets slip away. Despite the challenges of survival in such an environment, primitive peoples trekked hundreds of miles here to gather salt, and archaeologists have found large piles of discarded shells from ancient Khoisan “Strandlopers,” a nomadic people who carved out a fragile hunting and gathering existence along the beaches in this part of Africa. These days, the most abundant large life form you’ll find along the coast is the Cape fur seal. My friend, Outpost senior editor Simon Vaughan, described their gathering places as “scratch and sniff safari at its finest.” He wasn’t kidding. 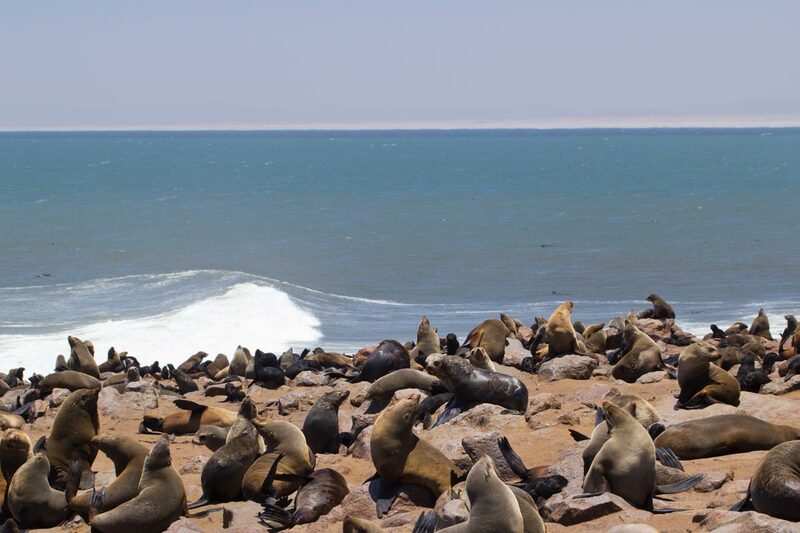 The smell of Cape Cross Seal Colony is a combination of overpowering musk, rancid urine, summer tannery, rotting fish and bloated seal bodies fermenting in the sun. Seals were sprawled everywhere by the thousands; about 250,000, according to park estimates. They bobbed in the sea and rode the swells at the water’s edge. And they gathered in hoarse shouting groups all over the sand. Dozens lay dead under the visitor’s walkway, many with their heads through the bars like convicts, and the young flapped back and forth across the boards but never went far enough to reach the open end. They chased us down with desperate searching eyes, bleating pitifully for a mother who isn’t coming back. A Cape Cross Seal Colony—fantastic to see, less so to smell. The entire place sounded like a zombie film. The dead rotted next to the living. And the living groaned aloud in a purgatorial cacophony in which I could hear each distinct voice: some cried out in childlike warbles and others with the world-weary hoarseness of old men. The stench grew worse the farther we walked, until it congealed into a palpable wall. All our attention was focused on avoiding the desperately lunging seals. It was a depressing place, filled with the cruel impersonality of nature. And it took hours to get that smell out of my nose. We didn’t see another animal on our drive up the coast, but despite its bleak appearance, the landscape does harbour life. Plants and insects have adapted to gather moisture from the coastal fog, and vast fields of lichen tint the gravel flats with ochre and grey. Lichen is actually two different organisms existing symbiotically: a fungus that provides physical support and algae that generates food and energy through photosynthesis. These delicate but ancient creatures play an important role in protecting the land from water and wind erosion. Tire tracks can scar them for decades. We finally entered the most remote section of the drive at the Skeleton Coast Park’s Ugab River gate. Visitors must transit during daylight hours. Rangers lock each end to new traffic after 3:30 p.m., and they carefully monitor who goes in, and whether or not they come out the other side. The road changed to rough gravel and sand-blown stone tracks. It’s a region notorious for punctures, and there isn’t another person for hundreds of miles. We had a spare tire of course, but we got lucky. Or so I thought at the time. The wreck of the Seal, 17 kilometres beyond Ugab, was our first glimpse of the Skeleton Coast image that I had from my childhood. The ship’s fragile wooden ribs, and the rusted remains of its trawl winches and engine, told a story of merciless pounding seas, of uninviting Antarctic currents, and the endless wind that erases your tracks in minutes, just as time erases every trace of those unfortunate souls who washed up here. 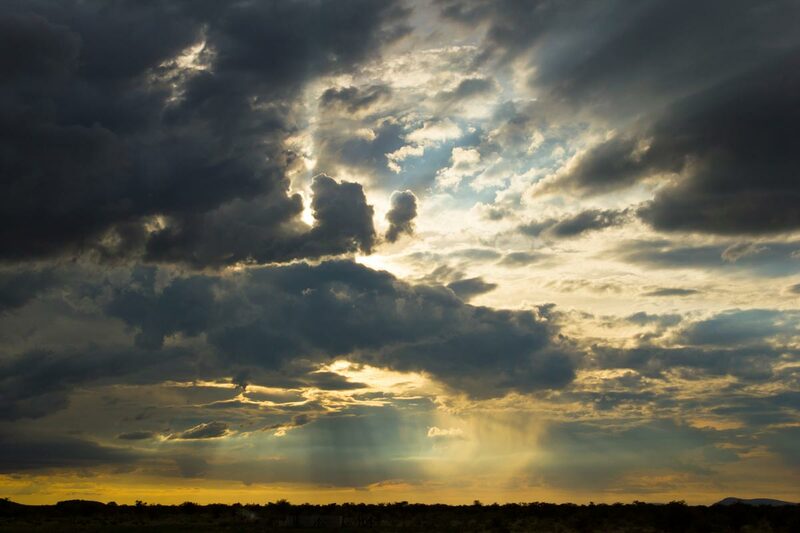 Rain storms sweep across the Etosha Pan. Later that day, we found abandoned pieces of mining machinery, long since rusted away, and the broken down corpse of a small oil rig. Someone had ventured into all this emptiness and heat with the forlorn hope of finding diamonds or oil in a cruel waterless place. And the coast beat them down and drove them out. As the first hints of twilight lit the edges of the scene, we finally reached the turnoff just before Torra Bay. 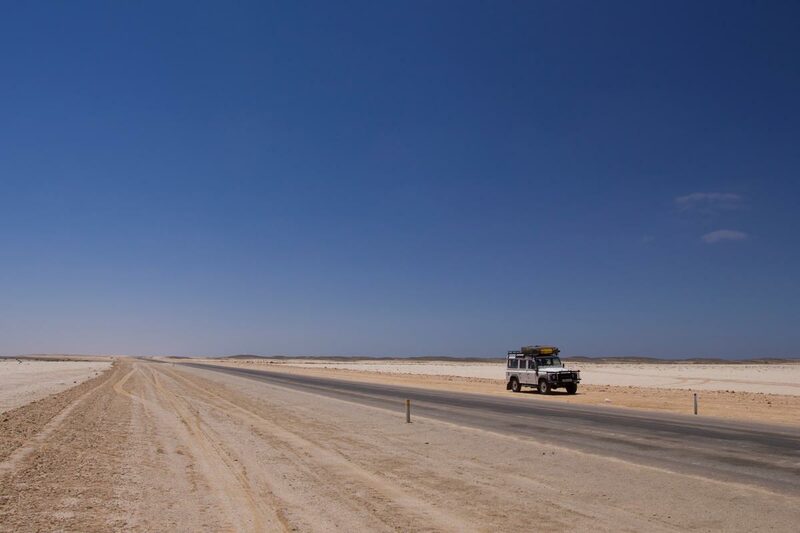 The road parallels the coast a little further, but the rest of the Skeleton Coast National Park is accessible only to fly-in visitors who are based at a remote private lodge. We had to reach our campsite before dark, so I shook the blood back into my shifting arm and made a hard fast drive through the beginnings of Damaraland. The 4 x 4 cruised over corrugations and potholes that’d shake a lesser vehicle to pieces. I fought a vicious crosswind that shoved the boxy car sideways, and snuck glances at herds of zebra grazing in open veld backed by craggy mountain views. But we couldn’t stop to photograph them. There were just too many hills and dry riverbeds in our way. Despite its unforgiving appearance, the Damaraland region has always been home to small human groups. The harsh volcanic landscape is dotted with caves whose silent inner reaches hold some of Africa’s best-preserved prehistoric rock art. Beyond the first range of mountains we found livestock, yellow grasslands and the occasional cultivated plot. Then huts and intermittent roadside clusters of people. We reached Granite Kopjes campsite as the last glow of sunset faded from the veld. At our secluded plot next to a small rocky outcrop, I was shocked to find running water, a kitchen sink, and a proper flush toilet with a view. I’d just popped up the roof tent when an old man shuffled over with an armload of wood. “Hot water?” I asked, momentarily confused. I certainly never expected that. And it wasn’t the only surprise Damaraland had in store. “What’s that green stuff?” Tomoko asked, pointing at the front of the truck. Coolant was leaking from the radiator at a steady rate—one drip every two seconds—and when I opened the hood the reservoir was dry. The Skeleton Coast had exacted its price after all, but damage assessment would have to wait until morning. After a cold Windhoek lager to slake our thirst and juicy Kudu steaks and veggies cooked by starlight, we climbed the narrow ladder, zipped into the tent and drifted to sleep on an African night chorus of insects and frogs. I dusted off the satellite phone early the next morning and called Martin at Safari Drive Windhoek. Elephants are known for their sense of awareness and Tomoko gets the shot. We found the turnoff next to a road sign warning of elephants crossing, and I was soon peering under the hood with a sunburned, bearded fifth generation Namibian called Johan Raubenheimer. “My grandfather was an early settler farmer near the Gamsberg Pass,” he said. “And my father was around at the time of your Henno Martin.” Johan had moved north to the sandy Huab River region—the same river that reaches the Skeleton Coast—where he lives like the local Herero people in a simple wooden shack that he built himself. But I learned those things later, when we were out tracking elephants. Johan removed a plastic fan cover and ran a hose into the reservoir. Water fountained out from the back of the radiator. He smiled, passed me a wrench, and we were soon up to our ears in screws, brackets and rubber hoses. A local Damara man called Lawrence joined us, and the dismantling became a team effort. It took all afternoon to get the rad out, and I’m not sure who swore more—me or Johan. “Where did you learn to fix these things,” I asked, wiping sweat from my eye with the only grease-free spot on my wrist. I laughed at that. Everything we carried was coated in a thick layer of dirt. There was nothing you could do but get used to it. With a bit of desert luck we put everything right back where it belonged, without any screws or brackets to spare. I dug into the cooler and found a round of cold beer. He changed a patchy tire on his Toyota and siphoned some gas from my own vehicle. Within half an hour, we were bouncing down two lane tracks that cut across vast fields of waving yellow grass, upthrust granite koppjes, isolated Herero huts, and children with donkey carts picking a slow patient path across the land. And on the horizon, the colossal bulk of the Brandberg, Namibia’s highest peak. “Is it OK?” Tomoko asked, pausing with one leg outside the door. When the stares of the males became a little too direct, when they flapped their ears in agitation, we drove a little farther upriver, then got out to watch them again. We could never have experienced this in any of the big-game parks. We were there at the tolerance of these elephants, and on their terms. And all because our truck had broken down. I cooked under the stars again that night—springbok this time, with fire-grilled veggies and pasta. Namibia has such an abundance of fresh food, and the purest free-range meat I’ve ever had the pleasure of sinking my teeth into. A herd of springbok, leaping antelopes. I’d just bit into my steak when we heard a dry cough outside the circle of our lantern light. I grabbed a powerful torch from the truck, in case a hyena had been attracted to our food. I reminded my wife that this was Africa, and we had to be on our guard. We scanned the darkness in tense silence, until a donkey meandered past with his head hanging down. He looked at me with sad drooping eyes, hee-hawed softly and shuffled off into the night. Tomoko cleared her throat and smirked. I didn’t say a word. When the dishes had been safely stowed, we dragged chairs to the centre of the largest open space and stuck a bottle of South African red in the sand. The desert skies were a view straight out of Hubble: world beyond world, galaxies and gases, advancing for as long as forever is. We sat there for hours, just sipping wine, as meteors scratched chalk marks on the empty desert night. It wasn’t the itinerary our outfitter had planned. But it was exactly what I had been doing all along. We saw one of the largest collections of petroglyphs in Africa at the broiling red basin of Twyfelfontein. We topped up thirsty tanks with $N800 of diesel (about $90 CDN). And we picked up two Damara hitchhikers on a rough gravel track to the Grootberg Pass. Digressions trumped our plans as always, and we barely made the entry to Namibia’s largest game park before they locked Galton Gate for the night. 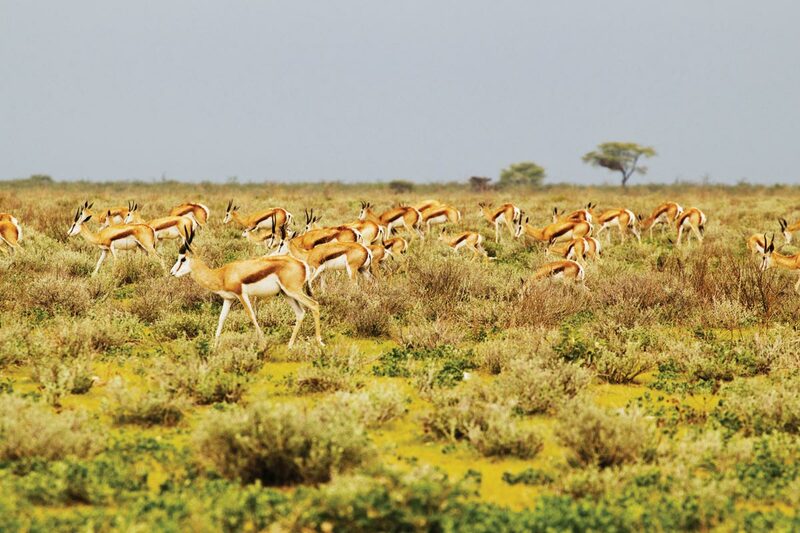 Etosha is divided into a private western side, accessible only to certain tour operators, and the heavily visited eastern side that holds the Etosha Pan. The west would be ours to explore because we had reservations at the newly opened Dolomite Camp. We rounded the second bend from the gate, and I had to slam on the brakes. 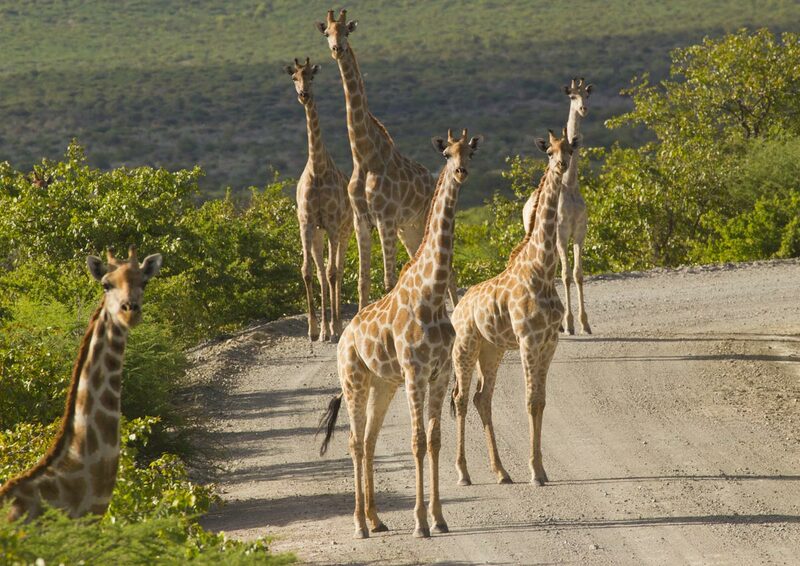 There were giraffe all over the road. At least a dozen, with several more making their slow stilt-legged way from the forest. I killed the engine and coasted to a stop, and we sat for 20 minutes just watching, until a truck came and frightened them off. As we made our way toward the camp, we saw clearings full of zebra, ostrich, gemsbok, a honey badger, and more springbok than we could count. The animals here were less accustomed to people; skittish but curious, and without the casual “seen it all” cool of those on the eastern side. The broad grassy plain was scattered with springbok, and a trio of giraffe had just crouched down to drink. Half an hour later, as the sun rubbed pastel thumb streaks on the sky, something kicked up a big cloud of dust on the tree line. A rhino was picking its myopic way down to drink. We’d only been in the park a couple hours, but we’d already seen a Noah’s Ark full of wildlife. And we had the waterhole completely to ourselves. 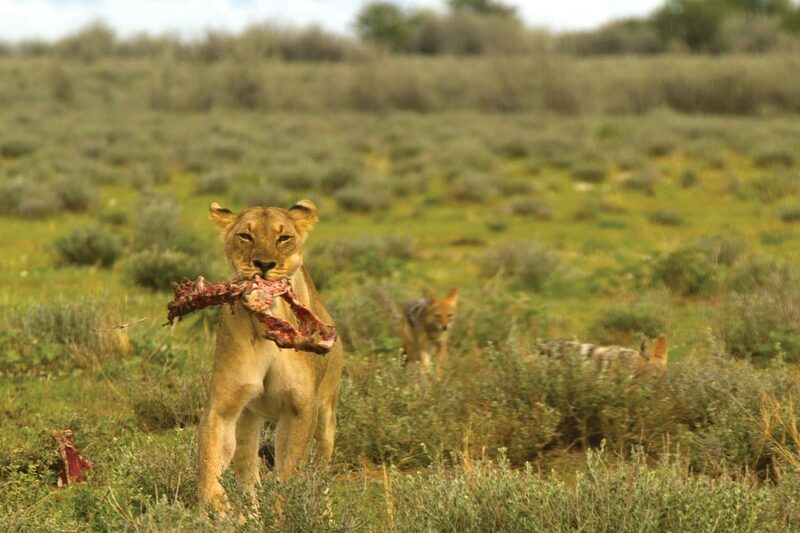 At Etosha, humans are fenced in and the animals roam free. No one is permitted outside after dark, unless on an organized game drive with rangers. The night belongs to the predators. We arrived at Dolomite just as darkness fell. I’d driven nine straight hours across very rough country, and an icing sugar of dust had turned my suntan pale grey. Our first stop had to be the bar. “Two Windhoek lagers, please.” The barman looked us over and poured them large without being told. I drank half of mine in one long icy swig, and my dehydrated cells swelled slowly back to life. The man on the next stool turned out to be the camp manager, Jan, and we talked about the joys of driving through Namibia in solitude, at our own pace. Giraffe mull around in Etosha National Park. “You shouldn’t have told him that,” Tomoko said, with visions of my back-roads driving obsession destroying the remains of our itinerary. The next afternoon, we stood on our high rock aerie and watched angry clouds pile up in the distance. They grew nearer and darker by the minute, and sheets of rain advanced across the plains. The staff scrambled to zip window flaps and tie down cushions by the pool. And then the storm struck with suddenness and ferocity. I found myself trapped in the library with one of the young waitresses. We moved tables and shelves to the centre of the room to save back issues of old magazines from the damp. Tomoko was trapped in the next building, the bar, where she was photographing the families of staff members, and forgot all about bringing over my beer. The thunder and wind swept on across the plain; then the sun came back, along with insects and lizards and bees. On the flatlands below, a herd of zebra lapped new pools of water as a solitary oryx watched from a distance. 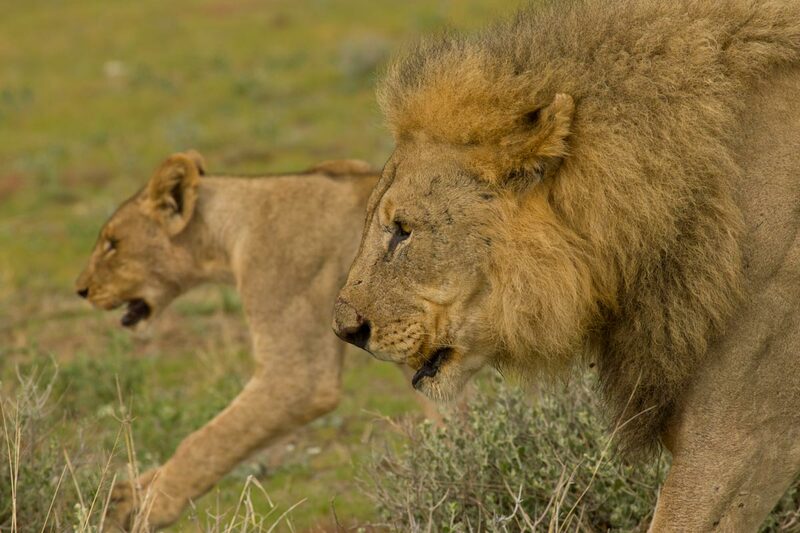 We spent the next two days driving through Etosha, from the solitude of the west to the busy car-filled east, where we had the soggy morning luck to run across a pride of lions huddled over a kill. By the time we reached the eastern gate two days later, we’d seen so many animals that “oh look, another lion” began to sound commonplace. Our last overnight stop was at a campsite below the red upthrust sentinel of the Waterberg Plateau. Lightning flashed in the distance that night, and I stared at the dying coals of my fire and poked a stick at the sandy ground. One last road day would take us back to Windhoek. But I didn’t want it to end. How can I sum up driving through Africa in just a few pages? The freedom, the challenges, the discoveries, the incredible diversity of animals, the friends made? There’s an incredible sense of exhilaration that comes from being completely responsible for yourself in the middle of this cradle of civilization, this continent as old as memory. What I’ve written here can only scratch the surface. As can any single journey. We knew we would have to come back. The next morning I was woken by a troop of baboons raiding a garbage can. They returned in time for breakfast, moving in slowly like soldiers crossing an open plain. A female with a baby on her back circled behind the car. When I got up to chase her away, she darted in the rear door and stole a bag of garbage. We were lucky she didn’t grab anything else. “It lured you in so you’d chase it!” Tomoko said. I gathered a small pile of rocks beside my chair, and returned to my coffee and the peace of my book. The baboons circled in for another attack, working as a team, their beady eyes fixed on my plate and their long sharp fangs exposed. I peppered their ranks with a bombardment of stones. After two more attempts, they gave up on us and raided a nearby camp of Germans instead, routing the entire group and walking away with their breakfast. It was time for our last Namibian drive. We were due in Windhoek later that day. We had it all down to a science by now: the packing and stowing and clearing of camp. In less than an hour, I was back behind the wheel, with the Waterberg Plateau half framed in the rearview, and us humming across the tarmac on C22. I spotted a small dirt road and flipped on the blinker. “What are you doing?” Tomoko asked. She smiled, grabbed a pencil and began to plot a route. Corrugated gravel gave way to smooth soft sand, and pools of water so deep they splashed the roof tent when I geared down to plow through them. Ryan Murdock is Outpost’s longtime editor-at-large for Europe. Check out more of his travel stories here and more Outpost travel stories here. Went on a similar cross-country trek in a rented jeep with my two kids in the backseat. Did the Cape Namibia route, which begins in Capetown and ends in Etosha. A great country to explore, even with no GPS, but Namibians are very hospitable and helped us out with directions innumerable times. The jeep had no flat tires which the rental car company told me was a miracle, though I did give it back with a crack in the windshield. My son, then 15, learned to drive on Namibian roads, (and standard transmission to boot), giving his mom a break once in a while. We did 4000 km in 12 days, but I would do it again in a heartbeat. A great adventure which you captured so well. Your photos are wonderful. Etosha doesn’t get enough ink, so good job letting more people know about it. Thanks Ilona. It’s such a great place to travel. I still think about going back there, but with my own wheels, and for a much longer journey. Thanks Amanda, glad you liked it. I’m envious of your trip.